First of all, I'm so excited to be back here posting on the blog! So far, this year has been one of the busiest of my life and unfortunately blogging had to take a backseat. Now that summer break is here though, Krista and I are looking forward to getting our hands dirty and bringing you all sorts of succulent goodness. We were talking the other day about some of the blog posts we have planned and she mentioned that we have never featured our own gardens. As you may know, I keep most of my plants in containers because I like to move them around as the seasons change, keeping them in the most optimum conditions. Krista, on the other hand, lives on the coast where her plants seem to do great planted in garden beds and stationary containers year round. I thought it was a great idea to feature her garden, so I grabbed my camera and took a stroll around her home, snapping shots of some of my favorite arrangements. As you make your way towards Krista's entry door, you are greeted on either side by stunning planters bursting with colorful succulents in every shape and size. 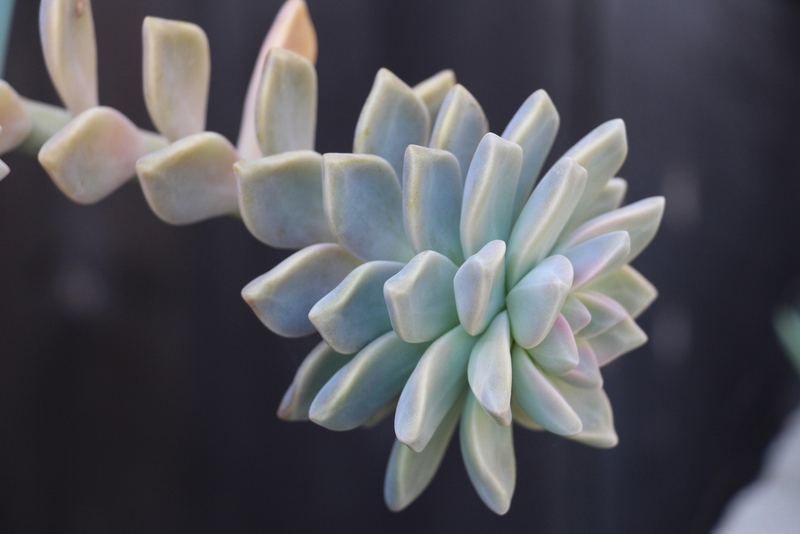 The muted colors of this Graptopetalum 'paraguayense' definitely take center stage! I love the way this fuzzy Panda Plant (Kalanchoe 'tomentosa") adds texture to the garden. The pointed leaves of this hot pink tipped Aeonium 'kiwi' compliment the thick round leaves of its neighboring Jelly Bean (Sedum 'rubrotinctum') plant. Graptoveria 'opalina' are a long time favorite of mine, with their striking thick leaves that can turn bright pink when exposed to extreme temperatures. As I made my way through the house en route to the backyard, I had to snap a couple photos in the dining room. Krista's Geometric Terrarium from World Market and Concrete Geometric pot add a little modern flare in her otherwise beachy abode. In the backyard, Krista has tons of succulents in a variety of containers from terra-cotta pots to cinderblocks. Below are just a few of my favorites. The cinderblock garden looks amazing from above! I hope you enjoyed this little peak into Krista's seaside garden! If you have any questions leave them in the comments below, and don't forget to follow us on Instagram @needlesandleaves!